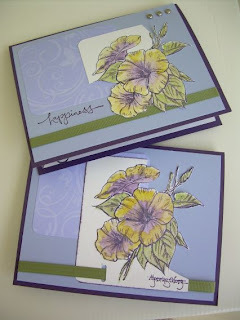 Before I left for Key West last week I made the two cards shown for a class next week. I love to watercolor and enjoy using our Watercolor Wonder Crayons. What is great about them is you can purchase them in your favorite color family. Further you can apply using our blender pens or our Aqua Painters. So your colors can be intense or very "washed" in appearance. The best is that the crayons will be available in the next catalog. Many of the items on the retired Accessory List are already sold out. If you have any questions on availability of an item feel free to contact me.